Whether they have a 9-5 job, a fledgling business or a young family, the people profiled in Extra Curricular are connected by their passion for keeping the right side of the brain active in their off-hours. They do it for the love of it - driven by a creative urge, they stay up late and work weekends in order to complete their latest side project. 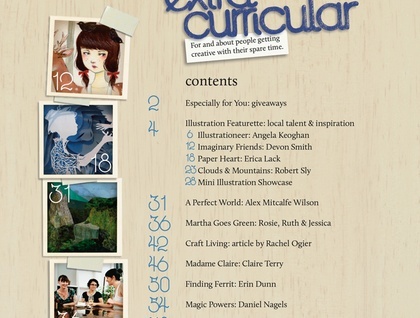 This issue includes a wee illustration featurette, an article about the craft craze and whether it's possible to make a living selling your wares, interviews with a leather tooler, a jewellery maker, a paper artist, and the girls behind 'Martha Goes Green' talk about self-publishing their vegetarian cookbook. There are a few other treats to be discovered too. 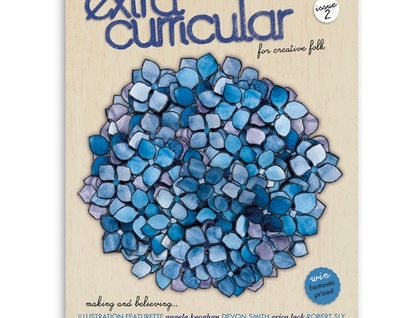 Extra Curricular is printed in full colour on beautiful recycled stock. The 2nd issue is out on April 1st 2010.